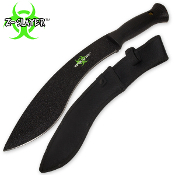 Black Survival Machete Undead Gasher Gurkha Kukri Full Tang - This is a supreme and essential tool in the Zombie Apocalypse. Weighing in a hefty 2 pounds, this Gurkha style kukri machete is unrivaled. Wrap your fingers around the handle (3.75 inch length) and get ready to take on the walking dead. The handle is specially crafted for an easy grip and gives great leverage when swinging the 11.75 inch blade at a demon's skull. The blade is razor sharp to the touch and should be handled with caution. Not to worry, though, because a sturdy nylon sheath with 2 button snap locks is included. Get yours today, packaged in our beautifully designed "UNDEAD GASHER" box.